We went to Chicago three weeks ago to find a place to live next month. No big deal. While we were there we got to check out Chicago's "Restaurant Row" on Randolph street. It's filled with fancy, world-renowned restaurants, most of which cost a pretty penny. I had to keep reminding myself "we are moving here, there will be plenty of opportunities to eat over the next 5 years". I want wanted to eat everything. So after almost two hours of waiting, we got into The Little Goat, the casual more affordable diner version of the very famous Girl and the Goat. Going there was a decision both our stomachs and wallets appreciated. Staying true to the diner vibe we split a blueberry pie milkshake. It tasted exactly how it sounds: like some brilliant person had baked up a sweet and gooey blueberry pie with flakey buttery crust and then blended it up inside a milkshake with thick creamy vanilla ice cream. I wasn't even halfway through my first sip before vowing to re-create it at home. And so over 4th of July weekend I did just that - but my version is dairy free. Remember that vanilla bean ice cream when made last week? This is the perfect way to put it to good use. Of course, you could totally sub in real butter, milk and ice cream, but either way the result is creamy, decadent, and tastes just like someone smashed a delicious gooey blueberry pie into a creamy cold milkshake. Make the crust. Whisk together flour, sugar, and salt in a medium bowl. 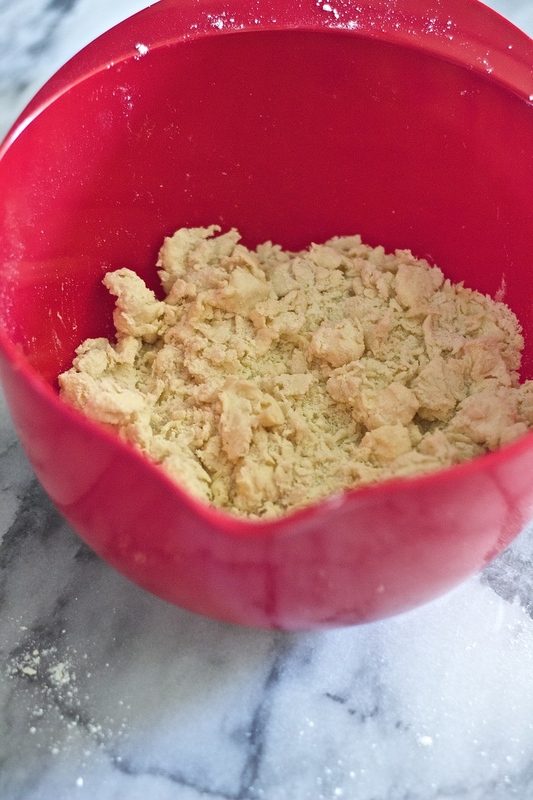 Using your hands, cut the butter into the flour until the butter chunks are roughly the size of peas. Pour in 1 tablespoon water, mix, pour in the second tablespoon and toss until the dough is shaggy and damp. Squeeze a handful of dough in your hand - if it doesn't form together in a cohesive ball add another teaspoon of water. Bring the dough together into a disc (it will be messy, that's OK), cover and refrigerate for 20 minutes. Meanwhile, preheat the oven to 350 degrees. On a floured piece of parchment paper, roll the dough out until it's the thickness of pie crust, keeping the dough on the parchment, transfer it to a baking sheet and bake for 20 minutes until just lightly browned around the edges. Remove from the oven and let cool. Meanwhile, heat the blueberries, cornstarch, vanilla, brown sugar, bourbon and salt over medium in a small saucepan. Stir as it cooks for 5-7 minutes until thick and bubbly. Remove from heat. Let cool. You can pop it in the fridge to speed up the process. Once the crust has cooled, break it into chunks with a fork. Toss blueberry mixture, ice cream, milk, and a little over half the crust into a blender and blend until smooth. Divide among two glasses and top with remaining pie crust and serve. Notes: Feel free to sub butter in the pie crust, milk, and regular store-bought vanilla ice cream.